Children of color celebrating their heritage and culture remembering their connection with Africa. 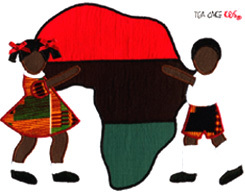 The t-shirt features the continent of Africa and characters wearing kente print clothing. White t-shirt 50/50 Poly Cotton Blend with custom design appliqué of character.